In its inaugural rankings for “Best Online Programs for Veterans,” U.S. News included bachelor’s programs, as well as master’s programs in education, nursing, engineering and business. EKU earned first place among the online graduate education programs for vets, beating Central Michigan University (No. 2) and North Carolina State University-Raleigh (No. 3). Arkansas State University-Jonesboro (No. 4) and West Virginia University (No. 5) rounded out the top five programs. Finishing a degree can be a challenge for veterans and service members. Active-duty troops often move from base to base, making it difficult to complete an academic program at one location. This is also true of the families of military personnel. Elizabeth Hicks, whose husband is now stationed in California, holds a bachelor’s degree from EKU and has enrolled in the University’s online master’s of education program. All of the ranked Best Online Programs for Veterans belong to institutions that are certified for the GI Bill and participate in the Yellow Ribbon Program, two federal initiatives that help veterans reduce the cost of school. These programs have taken steps to improve the higher education experience for veterans, said U.S. News in announcing the rankings. EKU, recently ranked 16th nationally among the “Best for Vets: Business Schools” by Military Times EDGE magazine, is home to more than nearly 1,000 veterans and more than 300 military dependents. The Military Times ranking for EKU’s School of Business follows a No. 1 overall ranking two of the past three years for the University. Other national honors in recent years further validate the University’s lofty reputation among veterans. Eastern has been recognized by G.I. 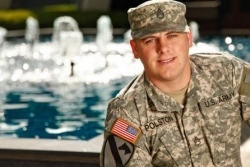 Jobs as a Military Friendly School each of the past four years and last year was named a Pat Tillman Military Scholar Partnership University, one of only 14 in the nation. Andrew Napier, an EKU senior from Richmond, was one of only 59 Tillman Military Scholars nationwide. Also last year, EKU was named a VetSuccess University by the U.S. Department of Veterans Affairs and now boasts a full-time employee on staff to help veterans with their benefits issues. As more and more troops return from Iraq and Afghanistan, EKU has more than doubled its number of military veterans and dependents in recent years. For more information about online degree programs at Eastern, visit go.eku.edu/vets or call 859-622-7441.